MIAMI, FL OCTOBER 10, 2018 - Ventura Holdings Group adds to their hospitality portfolio the Henrosa Hotel located at 1435 Collins Avenue Miami Beach, FL. This new addition is now one of three in their collection of hotels that include Cavalier South Beach on Ocean Drive and the Ramada Inn in Hollywood, FL. Henrosa Hotel offers 40 rooms of Classic Kings and Deluxe Doubles and is Recognized by the Miami Beach Architectural District 1979 and Miami Design Preservation League, in addition to Art Deco Historical Preservation. Ventura Holdings Group’s $7 million renovation to the Henrosa Hotel still carries the 1935 architecture, originally called the Biarritz Hotel, and the lobby entrance designed by architect Harry O. Nelson. Last opened to the public roughly 10 years ago, Henrosa Hotel features an asymmetrical façade design, continuous eyebrows of the original rounded hotel architecture, vertical racing stripes across the west elevation, neon signage, with a stretched octagonal porthole relief at first floor level that acts as a branded design element. The interior design and restoration was orchestrated by the mother-daughter duo, Gladys and Claudia Valdes, founders of Design by Shell. All restorative materials, paint and structural elements are purchased locally through Shell Lumber, Hardware and Design shop in Coconut Grove, FL. Each room is furnished with custom pieces and contains furniture from companies such as Guild Master and Global Views. Features of the interior design include coral reef chandeliers, refurbished Tropical Art Deco hand-carved wood lobby fire mantel, chic beachy linen, plush decorative pillows and wicker furniture, with bursts of colors mimicking sunrises and sunsets of South Florida. The lobby and hallways are still expressive from the signature original 1930’s terrazzo floors, lush greenery and Art Deco wrap-around mezzanine balcony overlooking the check-in and lounge area. South Florida birds and wildlife paintings, by Ben from Guild Masters, adorn the walls. Most of the wood furniture and wall art pieces are antique hand-carved and shipped from India, such as the shutters. Crown moldings are larger and more exclusive than the average hotel moldings. Anything you see gilded is hand-painted by the Design by Shell mother-daughter duo, using 24K gold and precious Silver. The bathrooms are marble tiled using white and grey elements with Kohler appliances accentuated. Each room features Egyptian cotton bedding, feathered duvet and pillows, central AC, 52in Smart TV including all premium channels, ability to stream your personal Netflix account, Wi-Fi, free local calls and wake up service, rain shower, small magnifying mirror, blow dryer, C.O. Bigelow bath product amenities, Bahama blackout shutters, safety box, small fridge, iron, iron board and full-length mirrors. 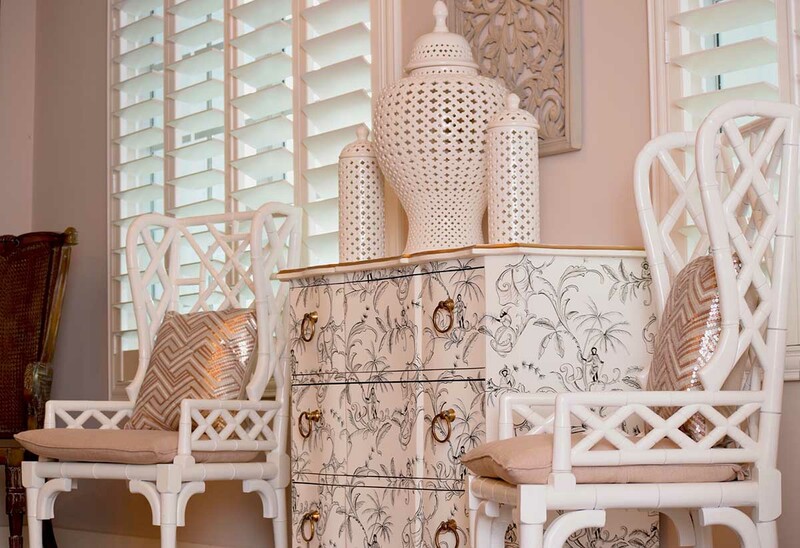 These design details create a sanctuary that allow guests to unwind in style. The Henrosa Hotel possesses masterfully created spaces that are inspiring and highly-stylized, while equally welcoming and comfortable. Room service offering will include small bites, wine and champagne. Guests are offered complimentary breakfast on the famed picturesque Espanola Way at Havana 1957which combines the flavors of traditional Cuban cuisine with the enchantment and sophistication of Havana in the 1950's. A partnership with Lobster Bar and Sea Grill provide guests with a discounted experiential dinner. With Henrosa Hotel’s tailored Miami specific packages which focus on air, land, and sea, guests have the opportunity to feel like they are truly part of the Miami Beach community. Henrosa Hotel offers bachelor, bachelorette, honeymoon, spring break and holiday packages. Each of these premium and carefully curated experiences is personally arranged by the Henrosa Hotel team, who specialize in customizing guests' stays. With elevated, tasteful memories designed to facilitate immersion in art, culture and authentic cuisine, Henrosa Hotel provides guests with unparalleled, tailored concierge services, several dining options, jet ski and yacht rentals, and more. Henrosa Hotel encourages and facilitates genuine connections and unforgettable moments for guests of all ages, across generations, for locals and travelers alike.